Ancient farmers discovered the advantages of composting human, animal, and botanical wastes to fertilize their lands. The ancient Chinese perfected the system of crop rotations to maximize land productivity. By the nineteenth century, however, most people were migrating to the cities as consequence of the Industrial Revolution. Suddenly there were fewer farmers to feed the ever increasing world population. In addition to that, available arable land was ever limited. What would happen when farms could no longer produce crops due to the land losing its productivity? It was clear that something had to be done. Between 1840 and 1860, Peru exported the bird guano from the Chinchas Islands, thus becoming one of the richest nations on earth because it was the most powerful fertilizer that nature could offer. Solely in the 1850, the import of guano by the United States, Britain, and France had tripled despite the increasing prices. But by the end of that decade, the Chinchas Islands were empty. The search for the next best natural fertilizer looked south of the Chinchas to the Atacama Desert's—then property of Peru—mineral rocks known as caliche from which sodium nitrate (salitre), also called nitrate, was purified. Towards 1870, the naturally occurring sodium nitrate from the Atacama was being used as both, fertilizer and for component of fireworks. Early attempts to introduce sodium nitrate as fertilizer in England had failed, but when chemists realized that by substituting sodium with potassium they could obtain "true saltpeter", the main component in gunpowder, salitre became popular. Soon, England, Germany, and France had taken claims in the Atacama, as well as thousands of Chileans that came to work in the desert. By the end of the decade, Peru realized that the Atacama area had been essentially colonized by foreigners. In 1879—as result of the Bolivian president raising taxes on the salitre extraction from their portion of the desert, combined with a secret alliance between Peru and Bolivia against Chile and its fearless navy—the War of the Pacific, also called Nitrate War, erupted. Chile won the war in 1881 and two things happened as result: Bolivia lost its access to the sea, and Peru gave up its claim on the Atacama Desert. By then, Europe and the United States were dependent on nitrates, as fertilizer, and as starting material for explosives. By 1900, Great Britain and Germany were among the world's biggest buyers. While Britain had colonies the world over that could grow crops, Germany—an infant nation in its modern form (c. 1871)—did not, thus having to grow its own food on poor soils, and sustain its rather ambitious military aspirations. Fritz Haber was a German Jew. Despite Germany being more accepting of Jews than other European countries—there weren't pogroms in Germany, and Jews could occupy important posts in many civil areas, though not in the military—, Haber converted to Christianity to make his assimilation as a German complete. He obtained a PhD in Chemistry and worked in several industries before accepting a teaching and research position at a university. His ammonia research started when he was working for an Austrian company. In 1905, Haber published his first findings on the synthesis of ammonia, but his yields were refuted by calculations made by prominent physical chemist Walther Nernst. Instead of giving up, Haber brought on board an assistant to help him figure out the set up of his machine. To break the triple covalent bond that holds both atoms in a nitrogen molecule together (NΞN), at least 1000 °C are needed. Once the nitrogen atoms are free, they can combine easily with three atoms of hydrogen to form ammonia (NH3). This latter step generates more heat, which decreases the yield of ammonia by evaporation. Less heat is needed, however, by increasing the pressure and incorporating an effective catalyst to the reaction chamber. By 1908, Haber and his assistant Robert Le Rossignol had started pushing the limits of high pressure chemistry, running ammonia synthesis between one hundred and two hundred atmospheres—pressures found about a mile beneath the ocean—, in experiments funded by BASF, Germany's preeminent chemical company. Those pressures were high enough to burst any reaction chamber, but Haber and Le Rossignol used thick-walled tubes made of quartz encased in an iron jacket. Working with higher pressures allowed them to decrease the temperature of the reaction down to 600 °C, which in turn increased the amount of ammonia produced. In the spring of 1909, Haber and Le Rossignol found out that osmium, a rare element, used as a catalyst, shot up the yield of ammonia to levels that could be commercially viable. Scaling up Haber’s machine was going to pose challenges. No quartz rock was big enough for a reaction chamber of industrial size. Among the BASF chemists and management who went to see Haber's machine in action was the head of the nitrogen work at BASF, Carl Bosch, who as it turns out, was good with metals and machines. In 1910, upon the publishing of his ammonia research, Fritz Haber gained wealth and fame. In 1911, he left his university post behind, and moved with his family to Berlin, where he had been offered to serve as founding director of the in-the-works Kaiser Wilhelm Institute for Physical Chemistry and Electrochemistry in the heart of Dahlem, a sort of Mecca for the study and research of chemistry. The first prototype ammonia factory started producing in 1911 under Carl Bosch's leadership. In September 1913, the second factory opened at Oppau. With Oppau, BASF pioneered the field of high pressure chemistry. Then WWI erupted. Fritz Haber volunteered for service as a scientific advisor. He wrote to BASF to inquire if there was a way that the ammonia machine could be converted to produce nitric acid, starting material for the production of gunpowder and high explosives like TNT and nitroglycerin. Carl Bosch agreed with the government that BASF could produce sodium nitrate as an intermediate step to obtain nitric acid, if the government paid for the expansion and retrofitting of Oppau. That's how Oppau became a defense industry. As the war went to the air and the Allies started bombing Oppau repeatedly, it became clear that another factory had to be built away from the Rhine, at Leuna. It took less than a year to build. Leuna was a marvel of technology that no one could replicate, a city-sized factory. In the spring of 1918 Germany's allies began giving up. Inside Germany, the political climate boiled over spurring revolution and forcing the Kaiser to abdicate and flee to Holland. In November, Germany surrendered without the fight ever taking place on German soil. With the end of the war, Germany was thrown into anarchy. A centrist Weimar Republic was formed but without much popular support. Meanwhile, French troops occupied the Rhineland. BASF's Ludwigshafen and Oppau plants were in that area, and were of importance to the Allies because they were part of Germany's war machine. Soon, French troops began appearing at Oppau with the objective of reverse engineering the machinery. BASF's lawyers managed to keep them at bay. With the looming Versailles peace negotiations, talks of millions of marks in reparations, and imminent dismantling of Germany's war machine and its military, Carl Bosch secretly brokered a deal to earn royalties from a Haber-Bosch plant he would help the French to construct. In 1920, the French pulled out. Carl Bosch was made head of BASF. In November 1919, Fritz Haber was named a Nobel Prize winner in chemistry for his work on ammonia synthesis. During the early 1920s, Germany went from one crisis to the next. In 1923, due to hyperinflation, Germany suspended reparation payments and the French returned; they collected their payment in goods, moving out again by 1924. In 1925, Germany's biggest chemical and dyes industries merged into what became known as IG Farben. Carl Bosch was named its director. From 1926 and on, Bosch directed his chemists' attention towards the production of synthetic gasoline. Farben became more of an international conglomerate than a German company. Deals with other chemical companies in Britain, the United States, and other European countries interested in building Haber-Bosch plants, supplied capital for Leuna's expansion. Then, the U.S. stock market crash of 1929 came, sending the world into recession. Germany was hit hard. American loans had kept the economy afloat, but with the crisis repayment was demanded. Unemployment became rampant, opening the way to radical groups taking hold of national politics, Adolf Hitler's ultranationalist Nazis among them. In November 1931, Carl Bosch was awarded the Nobel Prize in chemistry for his work on scaling up the ammonia synthesis. In January, 1933, Hitler was made chancellor of Germany. A mysterious fire in the parliament in February sent Germans into a frenzy. Hitler was given dictatorial powers. The first anti-Semitic policies rolled on in April. Haber's Kaiser Wilhelm Institute was hit hard because of the large concentration of Jewish scientists working in it. Forced to fire his Jewish employees due to the non-Aryan decree, Haber decided to resign his post as head of the institute, while secretly helping them secure jobs outside of Germany. In October of 1933, Haber, disillusioned and shocked with the direction of Germany’s politics, moved to England. He died in poverty in Switzerland, in January 1934, of massive heart attacks. In December 1933, the Nazis agreed to buy all the synthetic gasoline that Farben could produce. Higher tariffs were placed on imported fuel. In 1935, the Farben board made Carl Bosch its board manager, separating him from Farben’s day-to-day decisions in an attempt to silence his then increasingly anti-Nazi pronouncements. Also in 1935, Hitler announced that "he was no longer abiding by the terms of the Treaty of Versailles and that he had secretly rearmed Germany during the past two years, tripling the size of its army and building a twenty-five-hundred-plane modern air force." In the years leading to his death, Carl Bosch expressed his concern that he had, inadvertently, aided Hitler's policies. And it was true. In 1939 Hitler invaded Poland. On late April 1940, Carl Bosch passed away. "After the war... [a Nazi expert] testified that if the Allies had done nothing but destroy Leuna and the other synthetic fuel plants by bombing them day and night, the war would have been over in eight weeks." Disclaimer: while Thomas Hager extends his book beyond WWII to more recent times, and beyond socio-economics, to possible environmental impact around the world of the Haber-Bosch nitrogen fixation cycle, as well as going more in-depth about the lives and times of Fritz Haber and Carl Bosch, I have chosen to emphasize how the discovery of industrial nitrogen fixation (along with unsettling socio-economic climate and political unrest) gave rise to Nazism. 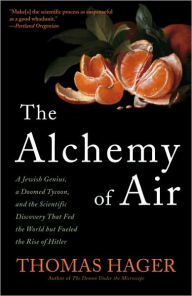 The Alchemy of Air is chockfull with valuable historical information. I read the book twice, back-to-back, to grasp its scope and to try summarizing it as best as I could. In the end, I chose to follow the chronological narrative for this review. 1) events surrounding four wars—the Guano War, the Pacific War, and both World Wars—, as well as providing a year by year (not always in a linear fashion) account from 1840 when the Guano trade started, to the end of WWII. 2) Chairman Mao Tse Tung's Leap Forward in 1958, China, thanks to which thirty million Chinese died from starvation and malnutrition. 3) the birth and development of Germany as a nation in its modern form, in all its political and military zeal. 4) the birth of chemical engineering as a scientific discipline, and the rise of BASF as an international conglomerate and a pioneering chemical company. 5) the discovery and advancements made by Fritz Haber and Carl Bosch, their lives, and their relationships with close relatives and other scientists of the era. Fascinating. I admire you for reading this. BTW, my husband has recently been reading a trilogy documenting China under Mao. He made it to the Cultural Revolution, but then he said he just had to take a break - too depressing. Now he's reading a Robert Crais mystery! It is important to read these books that are so heavy with factual historical information and you've done yeoman duty here, both in reading it and summing it up. Thanks, Dorothy! The book is actually shorter than my review may suggest, but it was so packed with information that I just couldn't let it all go to waste. It's interesting your husband reading about Mao. The Leap Forward in The Alchemy of Air is treated more like an afterthought, but by god! The man sent thirty million people to their deaths in just three years! Impressive Carmen! The reading and rereading, the summarization (I learned loads!) Thanks for all of it. And so typical, that a discovery originally intended to feed people ended up being used to kill them. That's the sadness of it. Wow - what a great write up. I think this is something that my husband would like to read so I will make a note of this. Thanks, Lynn. I hope if he reads it he finds it as interesting as I did. Wow that's extensive research & scope by the author. How did you come across this book? I have not seen it but it sure seems important. Nice going Carmen. Thanks, Susan. I came across this book looking for another one, of which I own a printed copy but wanted the Kindle version, and this book popped up as one I would like to read. Lucky find!